These flasks are suitable where interchangeability of stirring equipment, gas inlet tubes etc. is required in flasks of differing capacities. Centre neck and one angled side neck. The axis of the side neck meets the axis of the centre neck at the bottom of the flask. The ‘septum’ side necks have a parallel o.d. of 19mm and i.d. of 15.4mm and are designed for use with SW505-40 allowing safe liquid introduction by syringe. Centre neck and two angled side necks. 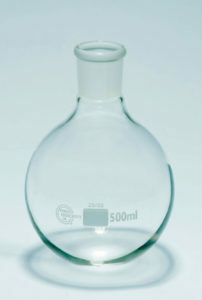 The axes of the side necks meet the axis of the centre neck at the bottom of the flask. Centre neck and one angled side neck. Centre neck with one parallel side neck and one angled side neck. The minimum distance between the axes of the parallel necks is 15mm. For use with rotary evaporators. Items FIB 250/3 and FIB 500/3 comply with BS 2735. Stoppers supplied separately. Standard wall. These flasks are intended for general purpose use. A heavier wall flask (FEH) suitable for vacuum work is detailed below.